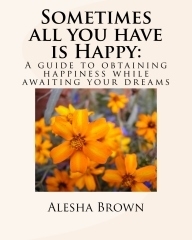 Alesha R. Brown has a life's mission to inspire, encourage and demonstrate how you can thrive in life and experience exceeding joy despite your past, abuse, mistakes, disappointments or any obstacles you have experienced in life. The journey called life can throw a series of curve balls and challenges but you can RISE ABOVE them. We at CarryONHarry Studios will soon be bringing Alesha R. Brown to share her life mission and uplift the audience with her thoughts. She has also written a book called Sometimes all you have is Happy : A Guide to Obtaining Happiness while awaiting your Dreams which will be in discussion and how this will help its readers to find that Happiness in life. This book is a magnifying glass to enable a person to identify the root(s) of his or her unhappiness and the necessary steps to live in victory. As someone who suffered from childhood abuse and thoughts of suicide, Alesha shares lessons learned in her journey that enabled her to transition from a victim to a victor. This book includes thought provoking questions and exercises to enable the reader to take the beginning steps to reclaim happiness, peace, purpose and power. You cannot conquer what you refuse to face. God has captured my attention for a time of reflection. There is no testimony without a test; no victory without a challenge and no battle won in the absence of a war. Who am I to not lead a movement to encourage and uplift hurting people? Who am I not to go as far as the end of the earth to share my story? Who am I to not conform to the ways of this world and know that I have a purpose, destiny and a mission that is unlimited? The naysayers don't have a voice unless you give them authority to speak into your life.